“Hooked: When Addiction Hits Home,” edited by Chloe Shantz-Hilkes, is not intended to entertain teens like “The Hunger Games” or the latest YA series. What it does is provide clear, stark, unflinching recollections from ten survivors, all of whom grew up with addicted family members. One boy’s dad was an angry drunk, a powerful weightlifter who nearly pushed him through a glass window. One girl’s brother started smoking weed in ninth grade, and by graduation was paranoid and hooked on OxyContin. Another girl’s mother was addicted to gambling, an addiction that can tear apart a family just like alcoholism. Each of these essays is fearless in describing what its author went through during their years living with an addict. Some of the survivors ended up moody and depressed, and they failed to excel in school. Others went the other way, obsessively throwing themselves into their schoolwork, because that was the one thing in their lives they could control. Interspersed among these survivors’ stories are bits of information or explanation: what an enabler is, for example, or notes that children of addicts are more likely to suffer from depression. The media love to focus attention on addicts. From tabloid reports of the latest star going to a posh clinic, to shows like “Celebrity Rehab,” addicts’ stories are common. It’s widely espoused that addiction is a disease, requiring treatment just like any other. The media rarely focus on the damaged or destroyed families addicts leave in their wakes. It’s just not something we think about. Once, a friend asked me to accompany her to a support group for families of alcoholics and addicts. I’d had experience with addiction, but this was the first time I’d heard how hellish addicts can make life for those around them. It was gut-wrenching. 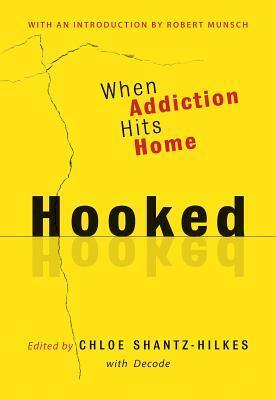 The introduction for “Hooked” is an addiction testimonial from noted children’s author, Robert Munsch. His personal story of alcoholism and drug addiction might seem out of character for somebody in his field, but it shows this disease can affect anyone. Following the essays are two helpful resources. One is a Q&A section with addiction expert Dr. Dennis Kimberley. The other is a listing of resources where a young person with an addict parent–or one dealing with his or her own addictions–can find confidential help, 24/7. “Hooked: When Addiction Hits Home” should be in every middle school and high school library, guidance counselor’s office, even as part of drug and alcohol education units in health classes. One in five families is touched by addiction. Being exposed to this book–with its stories and information–could help young people in equally dire situations find reassurance that they aren’t alone, as well as resources for them to get the help they need. This entry was posted in Books, Non Fiction and/or Commentary, Young Adult. Bookmark the permalink.